As Japanese society changes, companies here are being required to alter and add to the products and services that they provide to meet new needs. Arguably, nowhere are those changes more visible than in Japan's homes. Facing a shrinking and ageing population, the total number of households in Japan is expected to peak as early as 2019, reveals a study by the National Institute of Population and Social Security Research. And with existing housing stock already outnumbering households by 15%, that gap that now could widen even further. Recognizing these trends, the Japanese government has been realigning its housing policies. Where once it focused on developing new housing, it now aims to make more effective use of existing stock. Under its long-term strategy, the Ministry of Land, Infrastructure and Transport (MLIT) has outlined plans to boost the size of the secondhand home and renovation market. Worth 11 trillion yen in 2013, it aims to grow it to 20 trillion yen in 2025. Some of its specific policies include assistance for home renovation projects that make houses more environmentally-friendly and earthquake-resistant. In 2016, for example, partial funding was made available for homeowners undertaking "eco-reform" - starting with better insulted doors and windows to installing more water-efficient toilets. The government is also encouraging greater use of existing housing stock. One step is by facilitating industry initiatives to develop home valuation processes that take renovation into account. Houses in Japan are commonly valued by how long they have been standing. In other regions of the world such as Europe and the US, homes are more often valued by the state and condition they are in, not just by their age. According to a report by the Nomura Research Institute*1, though, in order to stimulate growth, creative solutions from the private sector are also needed. "We are moving away from the old scrap-and-build system in Japan," said Kazutoshi Taguchi, vice president and general manager of LIXIL Japan Company's Renovation Promotion Division. "But while there are enough houses out there, the quality of those buildings is not sufficient. At LIXIL, we want to change that. We want to enable people to improve older buildings and make them more comfortable." The largest segment is made up of people who have reached retirement age and want to install facilities to make their homes safer and easier to get around in. Next are the young couples who are buying their first home, opting to renovate an older property to make it fit their needs. The third group is couples in their mid-40s to mid-50s whose children are leaving home and who want to remodel their home to make the optimum use of the space. LIXIL has been holding "Reform Fair" events in major cities across Japan since 2015 to reach these customers, inviting home-owners to come and see for themselves just what can be achieved with an older home - starting at the front door. Kitchens are a prime target for upgrades. Bathrooms are another part of the home that is a priority for renovation. Similarly, bedrooms, home office spaces, utility rooms and living rooms can all be enhanced relatively easily. In total, LIXIL exhibits over 180 home-related products at these events. But growth in the home renovation market has yet to take off. One of the major advantages of renovation is that it enables consumers to tailor their homes to match their lifestyles. But with costs in the industry wide-ranging and not transparent either, consumers are often left feeling uncertain, according to research conducted by Housing Renovation Promoting Council. So, to drive new demand, LIXIL also introduced a new service called PATTO reform in October 2016. The new service aims to both clarify the cost of products and construction, making the entire process more transparent. This is a new approach for a manufacturer and goes against the traditional practice where customers are only provided packaged prices by contractors. LIXIL has so far set up a dedicated reception desk that will respond to inquiries within 24 hours, and harnesses a network of over 3000 registered "LIXIL PATTO Reform Service Shops" around the nation as of January, 2017. Consumers will now be able to immediately understand if the product and construction costs meet their expectations. If more details or an exact cost estimate are required, the registered service shop will perform an inspection of the house and provide the estimate within 3 days. 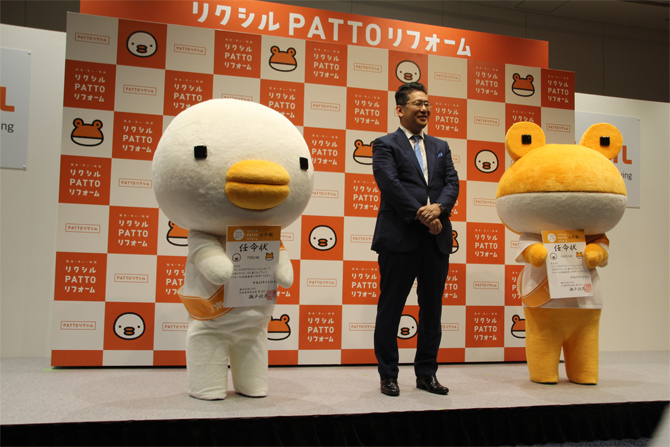 LIXIL's PATTO reform service is initially offering small-scale solutions (under 500,000 yen) – a market segment sometimes overlooked by contractors. Based on one of its customer-agency matching sites, 40% of customer inquiries are about small-scale projects. 20% of those inquiries, however, go unanswered. A contributing factor, LIXIL's analyst believe, is the declining number of construction workers in Japan, who prioritize higher margin work. Another reason is the prevalent atmosphere of uncertainty over costs. LIXIL aims to open the door to these customers and generate repeat customers by enabling them to try small-scale renovations at first, over time leading to medium and large-scale projects in the future. "We also know that work on the home can disrupt the household, so we have devised a way to do most of the preparation work at our factories in advance, which means we only need to remove the old components – such as doors and windows - and fit the replacements in within a short time, " Taguchi added. "Our approach is fast, it's simple, and to a family coming home at the end of the day, it's appealing." LIXIL CEO Kinya Seto emphasized the need for new approaches such as PATTO reform in order to drive market demand. "Innovations have to come from the customer's point of view. This is pivotal to not only growing the market, but helping people create better, more comfortable homes." It's not only homes in Japan that are undergoing remodeling, but the market, too.